A basic PCB starts with a copper-clad fiberglass material or thin copper sheets adhered to either side of the board, as shown in Figure 1-5. With a multilayer_ board (a board with more than two copper layers), a piece of Pre-Preg (Figure 1-6) may be placed between these cores to create one solid board with several copper layers (Figure 1-7). Pre-Preg is made of material similar to the core with additional adhesive that will adhere it to the layer above and below. Figure 1-7. Core material with Pre-Preg material creating a single board (one of two types). To discuss the board materials and options to a manufacturer, the terminology should be understood. The following sections explain the materials and the items that make up the material. PCB manufacturers will refer to the copper thickness in ounces, but during board lay-up, or when the materials are stacked together, the inch/mm thickness is used. When thickness calculations are made, multiples of .002"[.0508] or combinations are recommended. Copper plating is primarily used only on the finished board, on the external layers, and provides an additional thickness of copper to the board while plating the wall of the holes drilled in the board. The hole wall plating is the main purpose for the copper plating but still must be added into the overall thickness of the board. The average thickness for the plating is .0014"[.0356], ranging from .0012 to .0014"[0.0304–0.0356]. Usually the external plating is added after the board is drilled and the external copper on the board is etched, leaving a thicker trace, as shown in Figures 1-9 and 1-10. Figure 1-10. Plating after etching. 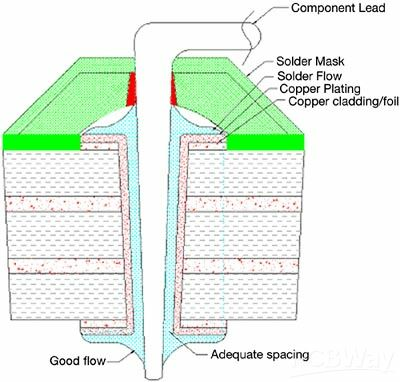 Solder flow is a process in which solder is applied to the external surfaces of the board on exposed copper areas (Figure 1-11). This helps prepare the board for soldering and protect the copper from oxidation. The copper areas on the entire board may be solder flowed, or a process called SMOBC (Solder Mask Over Bare Copper) will be used. SMOBC process is when the board is "masked" and only the exposed area (usually pads or areas that are to be soldered) will be coated with solder flow. Protect components mounted to the board. Protect the board from heat generated from components mounted to the board. Some standards do not view solder mask as an adequate insulator because of the inconsistency between board houses in types and inconsistent thickness after application. A trace on/in a PCB is relative to a wire. It provides the same function of transferring electricity from one point to another while the strength of the PCB provides a rigid material to place components on. The copper layers, as explained later, will each go through an etch process that removes unneeded portions of the copper, leaving only those traces and pads required. Formulas are necessary, but without a proper utility they are difficult to use and time consuming, which is why the accompanying software supports most formulas given in this book. A pad may consist of several different shapes and styles. Normally two types of pads are used, commonly referred to as a soldered surface-mount pad or a soldered thru-hole pad (Figure 1-13). Figure 1-13. Lead soldered into a board. A surface mount pad is nothing more than a square or rectangular copper area that is used for mounting surface-mount components. The size and shape depend on the component that is mounted/soldered to the pad. Most component manufacturers have recommended pad sizes for their components. A soldered pad may consist of a plated thru-hole pad (PLTH) or a nonplated thru-hole pad (NPTH). Both are nothing more than a round, square, or oblong pad with a hole through the pad. This allows a leaded component to be mounted to the board by placing the lead through the hole and the lead soldered to the pad area. The plated hole, shown in Figure 1-14, consists of a pad in almost any shape with a hole through the pad. The walls of the hole are surfaced or plated with copper and, in some cases, solder or some other protective plating. 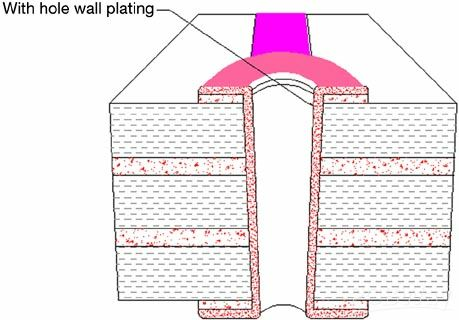 The plating in the hole extends from the external area and flows into the hole, "plating" the hole wall. Figure 1-14. Plated hole cross section. 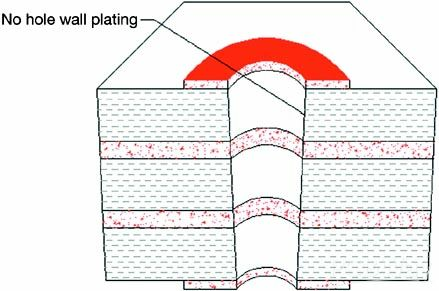 The non-plated thru-hole (NPTH) is nothing more than a pad with no plating in the hole. The pad is commonly used for single-sided boards or holes that have screw/mounting hardware. Figure 1-15 shows an unplated hole with no clearance on the inner copper layers. Unplated holes will commonly have an area around the hole clear of any copper (similar to the board edge) to prevent shorting between any objects that may be placed through the hole to any of the copper layers. If a board has no plated holes, it does not require the plating process. This reduces the overall cost (but in turn increases pad size), reduces available surface area, and doesn't allow internal layers. Figure 1-15. Non-plated hole cross section (no copper clearance). Slots and cutouts are similar to plated/non-plated thru-holes but are defined separately because of their shapes and characteristics. PLTH/NPTH are usually round holes but not always round pads, but the hole is drilled. A slot or cutout is cut into the board by a router bit and is an oval, oblong, or a rounded square shape. The "corner" of a slot or cutout is not square unless a special corner punch is used. Slots and cutouts are cut with a round bit; therefore the corner must be the radius of the bit, or larger. The router bit size depends on board thickness and manufacturer's capabilities. A small bit may be used on a thick board but must cut slowly to prevent breakage, increasing time and cost. The board edge deserves its own definition and attributes, due to the values that define the board edge. The board edge is any part of the board that exposes the cross section of the board, including slots, cutouts, and the outer edge of the board. Si tiene alguna pregunta sobre el pedido, no dude en contactarnos. ¿Como podemos mejorar este articulo? Ingrese su dirección de correo electrónico real o inicie sesión para dejarnos un mensaje. Entendemos ¡Gracias! Utilizaremos sus comentarios para mejorar nuestros artículos de ayuda. Si no puede encontrar soluciones a su problema aquí, díganos a través de Facebook o Twitter. What is the X-out board? Why the boards miss the cutouts/sots in the files. Why the non-plated holes /slots in the files are produced as plated holes /slots and cause short circuit problem? Why the pads don't cover soldermask as designed on gerber files? Why the vias produced as soldermask opening when I choose tenting vias for my order? If my design include gold finger and I need to do bevelling, what should I do? If my gerber file include soldermask and silkscreen layer but I choose no soldermask and no silkscreen on your website, what will you do? What is your factory’s standard of panel by tab-route? What is your requirements of V-cut? How to remind PCBWay to pay attention to special notes ? How to make my silkscreen clear and beautiful on PCB ? What diameter of via is better to have soldermask covering ? What is not correct for bottom text ? Can I send the working gerber files to PCBWay for PCB production? Why did your technical reviewer reject my order? I want it 2 layer even though there is no track on the bottom, I only need the soldering pads. How to design the half (castellated) holes for PCB?